March Madness Preemption? Use the Rush App! RUSH: Oh, man, what a great surprise this is. Apple beta day! Hubba hubba! Hang on, folks. Download and install. Right on! I keep holding out hope they’re gonna reactivate a feature, and I know they’re not. And I’ve been hoping they’re going to since September, and I know they’re not. You know what this is like? It’s like knowing there’s no Christmas, but hoping it’s gonna happen one more time and knowing full well that it won’t. Did we do the Open Line Friday jingle or not? Well, do it. RUSH: I knew I talked through that. Diarrhea of the mouth today. It is 800-282-2882 if you want to be on the program. Email address, ElRushbo@eibnet.us. Let me check on this beta install here. Yeah, baby. Hubba hubba. Okay. This is a note about the app. Folks, do you remember — we’re now into the March Madness time of the year, the NCAA basketball tournament. And during, I don’t know, the first maybe 20 years, maybe even longer, at this time of year, when they’re playing tournament games all during the day ’cause they gotta get through a whole bunch of them real fast, gotta go through the whole field in like two weeks, well, numerous EIB affiliates would preempt this program to carry college basketball games, and many listeners here would constantly complain about it. They complained to the local affiliate, they will complain to us. There was not much we could do about it. We knew when we signed up various affiliates that they would do this. I mean, the college basketball tournament, the NCAA is a big deal, particularly in markets where teams are in the tournament. But, you know, now it doesn’t matter. 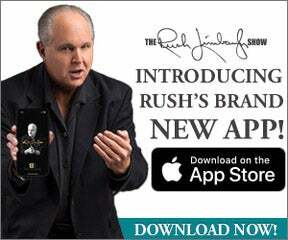 Now it doesn’t matter because there is the app, the RushLimbaugh.com app, and you can stream the program. If you’re a member you can stream the program, and it doesn’t matter what your local station is doing. And the app has been redesigned and reworked, and the streaming is for members, but even on the free side there are transcripts that are updated pretty frequently from when they’re uttered and done here on the program. They are searchable and they are sharable. So there’s all kinds of benefits to having the RushLimbaugh.com app as well as that. And what reminded me of this is this story in USA Today, Millennials don’t even watch college basketball. There’s all kinds of stories out there about what Millennials are watching and where. Are they watching it on TV sets, or are they watching it on devices? You know there’s actually been surveys done on that? And here’s how it goes. I’m having to commit this from memory ’til I can consult the actual data, I might have this somewhat wrong. But the way it works is that Millennials initially watch the vast majority of stuff on their devices. And, as the years go by, they then gravitate to TV. Or maybe it’s the other way around. I’m gonna have to look. Regardless, the traditional way of delivering content and advertising has been thrown upside down. But not for us. We remain unaffected, because we are available any way you want to get us. You can get us with video with the Dittocam. You can get us on the app. You can get podcasts delayed, listen to them whenever you want. You can get us live on the website. And since content is king, and we have ways of measuring whether you’re listening whenever you are, we have been unaffected by it. But all these other entities — the Millennials don’t care about college basketball. Well, that hasn’t happened to us yet. Ah, Millennials, they don’t really care about major league baseball. That hasn’t happened to us yet. Well, I don’t think it will.